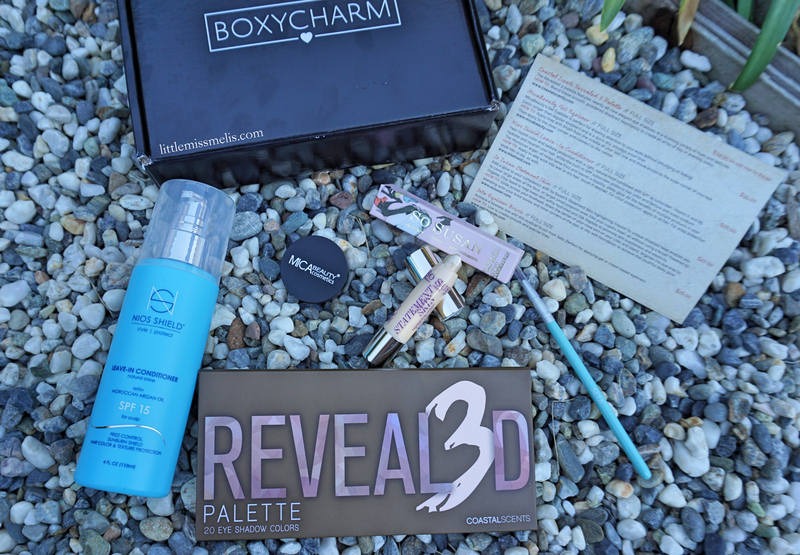 Moving along with the subscription boxes this month – today’s post is featuring BoxyCharm! BoxyCharm is a little different than some of the other subscription boxes because it is $21. HOWEVER, you get 5 products that are typically ALL full sized (occasionally one will be a LARGE deluxe sample). I have never received a box that had under $100 worth of value within it which is just crazy!! This is hands down the best box for your money and provides some really great products. If you are thinking of subscribing to just one box, I think BoxyCharm is your best bet justt because of how incredible the value is. Sign Up HERE! So, lets take a look at what the August 2015 BoxyCharm came with! Coastal Scents Revealed 3 Palette – $19.95 Value: Yes, we literally got an entire palette in this months box! I have previously received the Revealed 2 palette and I know in a box before I subscribed they got the Revealed 1 as well. I LOVE these palettes. Sure, they are not my favorite eyeshadows of all time, but they give you so many colors and you can create so many looks with just one of these. I think it is a great addition to any collection! MICA Beauty Gel Eyeliner – $35 Value: I like gel eyeliner a lot and I particularly like this one because it. is. black! I currently have the MAC version and while I do really like it, sometimes I feel like it could be darker. This formula is a little creamier than my MAC gel liner which makes me think maybe it would smudge – but I haven’t had a problem so far with it! Seta Eyeliner Brush – $16 Value: I think it is so cute that they gave us the gel liner and the liner brush. I currently use just the MAC angled liner brush when I apply any gel liner, but I actually like this brush a lot better! It is suuuuper thin and seems a little stiffer which makes getting that perfect thin line really easy! 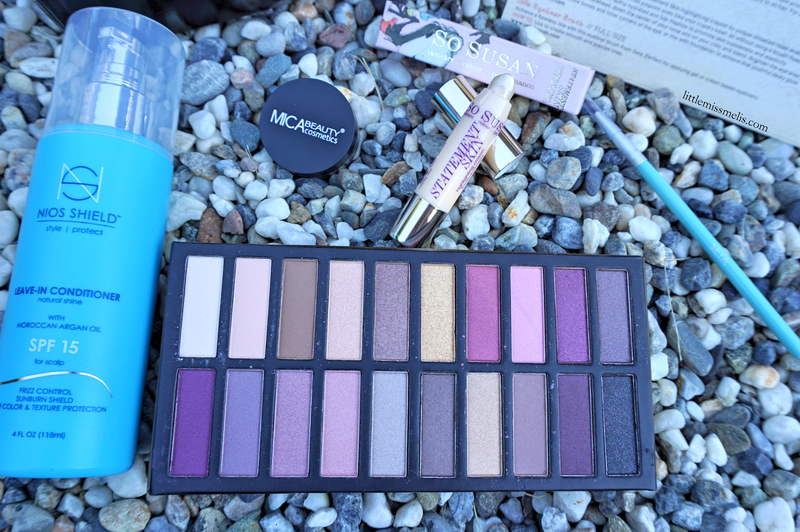 I also just love the color of the packaging – my all time fave! So Susan Statement Skin Highlighter – $20 Value: Ok, I’ll be honest and say I was super excited for a highlight in this box but…. I am notttt a fan of this highlight (one of the first products i’ve gotten from boxycharm that was ehh). I am more of a fan of peachy/warmer highlights that almost blend in with my skin tone and this is VERY pearlescent. I think the formula is a little greasy when applied directly, although it is really easy to blend out and may be nicer when applied with a brush. That being said, it would be really nice as an inner eye highlight or even for a pop of highlight in the center of the lid so I am excited to use it more like that. Maybe for someone with slightly paler skin it would be super pretty – but just overall not my fave. NIOS Shield Leave-In Conditioner – $26 Value: THIS was the product of the month for me! I know I sometimes hate how many leave-in conditioners I get in these boxes but this one is sooo cool! It has sunscreen in it and seems much more like a lotion to me – which I LOVE for my uncontrollable crazy curly frizzy hair. Anything to weigh me down – bring. it. on. I will 100% be repurchasing this on my own when I run out – which may be never because it is suchhhh a large amount! (ahh, I love you BoxyCharm). Full size products really are the way to my heart. Anyways, this product is also cruelty free – no animal testing and has no phthalates, synthetic dyes, sulfates, parabens, or PABA. Woop Woop! Overall this box has a value of $116.95 – and you pay $21!! I still cannot get over how great this box is. EVERY TIME! Such incredible value and really truly high quality products that I use on a regular basis.